efforts fall roughly along two paths: one, building cleaner plants, and two, cleaning up or shutting down existing dirty plants. China, world’s largest energy consumer and the third-biggest LNG importer, boosted its imports of the chilled fuel in February by 28.5 percent year-on-year. China’s LNG imports increased to 2.37 million mt in February when compared to 1.85 million mt in the same month in 2016, according to the General Administration of Customs data. The country’s imports rose to 3.44 million mt in January, the second-highest monthly import level, behind a record 3.73 million mt set the month before as a cold snap across the country spurred demand. According to Xinhua, Beijing has become the country’s first city to have all its power plants fuelled by natural gas, an objective laid out in 2013 in the capital’s five-year clean air action plan. …high readings are still being recorded in other parts of northern China, including parts of the major metropolis of Tianjin which sits next to Beijing, and the province of Hebei that surrounds Beijing. The country’s northern provinces mostly rely on the burning of hundreds of millions of tonnes of coal each year for heating. Natural gas and electricity can be substitutes for coal in heating buildings in north China, the official Xinhua News Agency reported, citing President Xi Jinping as saying at a government meeting on Wednesday. Long simmering tensions between China and formerly colonial powers, especially Imperial Japan, continue to influence trade, investment, and cultural relations, and also influence Chinese movies. 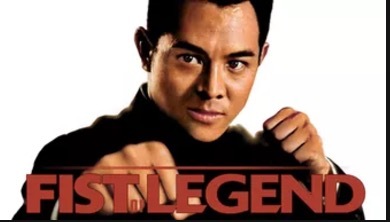 A 1994 Jet Li movie, Fist of Legend, is set in the Shanghai International Settlement.during the Japanese occupation of Shanghai. 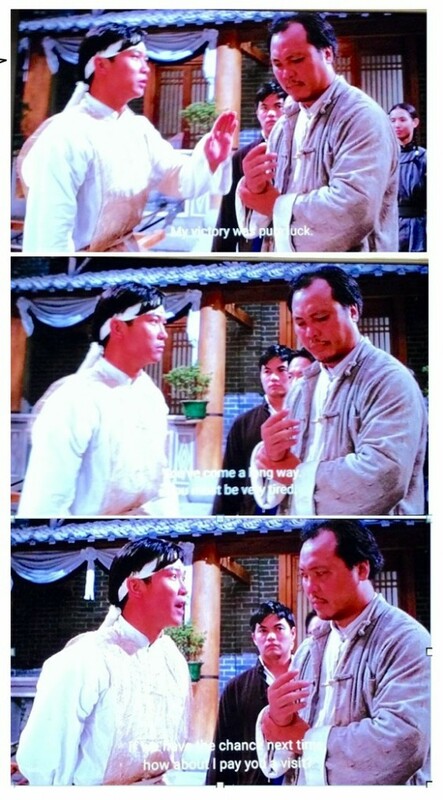 A fight scene early in Fist of Legend, pits two fighters, one apparently friendly with the Japanese, the other not. The pro-Japanese guy gets thrashed, but viewers not understanding Cantonese (spoken in Hong Kong and nearby southern China) might be confused by the conversation that follows the fight. I watched the movie on Netflix and by accident had both English dubbing and subtitles turned on. You’d think dubbing and subtitles would tell a similar story. Not here. In the screen captures below, readers can (barely) read the white subtitles. My victory was pure luck. You’ve come a long way. You must be very tired. If we have the chance, next time how about I pay you a visit? Very diplomatic, trying to ease tensions after the conflict. Maybe a nice metaphor for improving China/Japan economic and cultural relations after past conflicts. 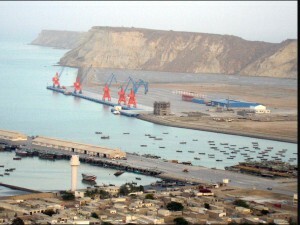 The massive infrastructure projects, along with hundreds of others across Asia, Africa and Europe, form the backbone of China’s ambitious economic and geopolitical agenda… creating new markets for the country’s construction companies and exporting its model of state-led development in a quest to create deep economic connections and strong diplomatic relationships. “It’s a wonderful thing from which we’ve all benefited, apart from the people who paid for it to be built who lost substantially all their money,” said Douglas McNeill, investment director and analyst at Charles Stanley. How much spending by Chinese central and provincial government banks building factories, housing, and infrastructure inside China over the last decade has been for good and how much poor investments? Only time will tell. Much depends upon returns earned from factories, housing, office buildings, railways, dams, coal, solar, wind power installations, ports and airports, and highways. The next trillion dollars spent building transportation infrastructure across Asia, Africa and Europe will face similar market tests, as revenue generated may or may not pay for the cost of design and construction. … Local companies had agreed to guarantee hundreds of millions of dollars of one another’s loans. When some of those loans went bad, the impact rippled across the city. Zouping’s plight offers a sobering example of the problems that could lurk within China’s vast and murky debt load. A nearly decade-long Chinese lending spree drove growth but burdened the economy with one of the world’s heaviest debt loads, equal to $21,600 worth of bank loans, bonds and other obligations for every man, woman and child in the country. Debt in China has expanded twice as fast as the overall economy since 2008. Already, a big rebound in “shadow finance,” primarily bank-mediated company-to-company loans, is papering over the cracks in China, blunting the impact of the tighter corporate bond market. While corporate bond debt outstanding fell by 58 billion yuan ($8.4 billion) in the first quarter of 2017, shadow finance ballooned by more than 2 trillion yuan, nearly twice as much as in the fourth quarter of 2016. As the US/China topic debate season draws to a close, it looks like the long predicted collapse of the Chinese economy won’t happen in May or June. The key question is how much Chinese government banks loaning to state-owned enterprises, combined with casino like shadow lending has distorted the still-expanding Chinese economy. This new-found anxiety is a blow to a market that had started to recover in 2016 from the liability web that entangled local governments and their financing vehicles after 2008. Despite not seeing any defaults, LGFV bonds became the poster children for China’s ballooning debt problem. For many investors, the debt is symbolic of the country’s excesses in the wake of the global financial crisis, when municipalities — barred from issuing bonds on their own — used the vehicles as a way of meeting funding shortfalls. China’s centrally-administered state-owned enterprises (SOEs) have a promising future in boosting mass entrepreneurship and innovation, Premier Li Keqiang has said. Premier Li said he believes centrally-administered SOEs have more potential and opportunity in implementing mass entrepreneurship and innovation as they are rich in technology, talent, capital and resources. Government owned and managed enterprises have a mixed record across the world, with a great many expensive failures. Next door to China is South Korean, fifty years ago an impoverished country recovering from war and partition, and suffering from misguided economic policies. In the years immediately after the war, South Korea’s disastrous economic policies produced alarming inflation and food shortages. Economic advisors from the U.S. made things worse with poor economic advice. An economics professor from Dartmouth described his early work advising the South Korean government on collecting taxes. Theater owners were fudging attendance figures to reduce tax payments. So U.S. advisors recommended the government set taxes on the number of seats in each theater rather than claimed number of moviegoers. Before long tax revenues from theaters again fell, and South Koreans were sitting on the floor to watch movies. Still, advocated of government “guidance” and direction of economic development see success story in Japan, Taiwan, Singapore, and South Korea, all of which had heavy government involvement in their early stages of economic development. Market advocates argue most of these interventions were and are misguided, diverting resources and subsidizing failures, and slowing authentic economic development. With mixed economies like South Korea and China (as well as Japan, Taiwan and Singapore), successes and failures can be credited and blamed on either private enterprise or government’s guiding hand, often depending upon the preferences and preconceptions of researchers. The South Korean government aided major family-owned corporations (called chaebols). The Foreign Policy article, “Success Story in South Korea” was published in 1969. [WSJ]You argue that China’s state-owned enterprises don’t have the power that their opponents say they do. What’s your proof? [Lardy] SOEs appear to be a relatively small portion of the Chinese economy. They account for between one-third and one-quarter of GDP. But in manufacturing, SOEs only account for 20% of output. In some parts of the Chinese economy, the private sector has largely displaced state companies. [WSJ] You also say the notion that China flourishes because of “state capitalism” is outmoded. Why? [Lardy] State capitalism means a high degree of state ownership of production, a great deal of control over investment, a great deal of control of the banking sector and a very substantial use of industrial policy. I don’t think the term ‘state capitalism’ fits China very well because its industrial policy has been an almost complete failure. One of the paradoxes of China’s debt troubles is that the country is awash in debt, yet publicly listed or privately held companies can find it hard to borrow. The state-controlled banking system lends mainly to state-owned enterprises, which can seem like a good credit risk because they have implicit government guarantees. In response, private companies often band together, guaranteeing one another’s borrowings, to give bank credit officers more confidence that loans will be repaid. The downside is that if one company runs into trouble, it can drag down the other companies that guaranteed its debts. Those other companies, in turn, can set off their own credit guarantees from yet more companies with no direct connection to the first one. China’s economic slowdown is hampering municipalities’ ability to support the 5.6 trillion yuan ($818 billion) of outstanding onshore notes sold by local government financing vehicles, which ballooned after the financial crisis when they used them to meet funding shortfalls. The notes offer an improvement over LGFV bonds because of cash-flow visibility, analysts said. The vast overinvestment in steel and aluminum production as well as shipbuilding and other heavy industrial enterprises across China were built on enthusiastic local government support and debt. Until last year the Yangzhou Guoyu Shipbuilding Company was a bustling village of 6000 workers striving to fulfil worldwide orders for new ships. Today, in a scene repeated across China’s industrial heartlands, the yard stands silent but for the howling of stray dogs around its deserted docks. Outside the closed gates is a ghost town of abandoned workers’ dormitories, closed restaurants and crumbling internet cafes. Much of Yizheng’s 27km stretch along the Yangtze’s northern bank 320km upriver from Shanghai is now a wasteland, where idle cranes loom half-seen through choking grey haze. Unfinished hulks of ships are left to rust. Chinese shipyards capable of building large ocean-going vessels have roughly halved in number since 2013 to about 70, he said, while hundreds of smaller shipyards have gone bust. 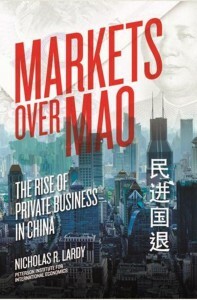 So, against the optimistic claim: “China’s centrally-administered state-owned enterprises (SOEs) have a promising future in boosting mass entrepreneurship and innovation…” is the reality of failed enterprises championed and funded in the past by local and central government bonds and banks. Local governments’ fiscal woes come as they face the prospect of either continuing to support highly indebted state-owned enterprises, especially in steel and coal, or allowing them to close and taking on the burden of additional pensions, unemployment benefits and unpaid debt. Despite past failures, prevailing wisdom once again says U.S. national security policies must target the ideology behind the threat in developing nations through taxpayer-funded development and modernization programs. Nowhere else in Africa do China’s financial, diplomatic and geopolitical interests confront as much risk as they do in South Sudan. 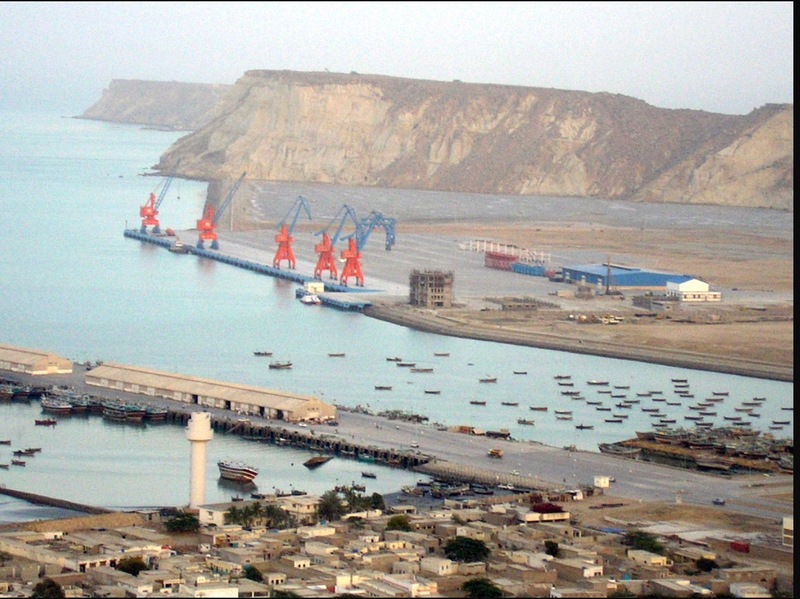 Beijing has invested billions of dollars in the country’s oil sector, deployed about 1,000 troops to serve as U.N. peacekeepers and committed considerable diplomatic capital to help resolve the ongoing civil/ethnic war. East Africa has been the fastest-growing region on the continent over the past decade, but trade between the United States and the region’s main economies remains limited. In 2014, Kenya, Rwanda, Ethiopia, Tanzania, Uganda, and Burundi all had higher growth rates than the United States. Despite this growth, U.S. trade with the region has been marginal and represents only 5% of total East African trade. East Africa’s main trading partners are China, India, and the European Union (EU). Regional integration has played a key role in boosting intra-East African trade and increasing the region’s access to global markets. The East African Community (EAC), a regional economic community that was originally founded in 1967 and revived in 2000, is the leading regional organization on the continent. Since 2000, the EAC has gradually reduced tariffs, trade barriers, and bottlenecks in the region, helping members increase their trade performance. 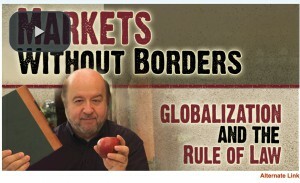 Peruvian economist Hernando de Soto, in a short video “Markets Without Borders,” argues that the legal exclusion of most Africans from formal rule of law institutions restricts their options for engaging in world markets. DeSoto ar gues that one-third of the world’s population lacks access to the rule of law, and elites of the world tend not to be bothered by that. The video looks at the informals of Tanzania as well as Peru. Globalization is a civilisation in the making. Civilization has always been designed by elites. And the tendency of elites has always been to feel that if it just covers themselves and maybe the top ten to twenty percent, it’s alright. If globalization doesn’t create the space required for those who are excluded to come in. Does not give them the instruments, the tools with which to prosper, they will be left out as orphans. And these orphans will end up bringing civilization down. Long a territorially focused group with quasi-governmental ambitions to impose Sharia law at home, al-Shabab is now becoming a more mobile, networked regional presence. This has brought it a number of benefits. Al-Shabab’s growing reach along the African coast is providing valuable new sources of funding and recruits. This is a logical adaptation: enhanced global counter-terror finance efforts have strangled funding from the Somali diaspora, amongst other international sources. In terms of recruitment, as foreign fighters have been drawn to Syria, the group has been overshadowed on the global stage. Yet al-Shabab has stepped up its Swahili-language propaganda – which plays on deep-seated social, economic and political grievances in East African states. At a time when the United States has grown increasingly alarmed at the spread of Islamic extremism in Africa — from Boko Haram in Nigeria to al Qaeda in the Sahel region to the Islamic State in Libya — the resilience of al-Shabab has highlighted the limits of the Obama administration’s approach to counterterrorism on the continent. American drone strikes, coupled with financial and material assistance to a 22,000-strong African Union peace enforcement mission (AMISOM), have succeeded in driving al-Shabab from most urban areas. But those policies have not prevented the group from continuing to strike civilian, government, and AU targets as it seeks to expel AMISOM and establish an Islamic state in Somalia. Kenya plans to shut the Dadaab refugee camp by the end of May. Dadaab is home to more than 300,000 refugees, most of them Somalis. Tens of thousands have already returned to Somalia. Humanitarian agencies are currently struggling to save lives in Somalia, where more than 6 million people need assistance because of drought and insurgent attacks. The aid agencies warn if nothing is done, the crisis in Somalia may become worse than the 2011 famine. The United Nations estimates more than 17 million people need humanitarian assistance in East Africa. “Kenya, having taken into consideration its national security interests, has decided that hosting of refugees has come to an end,” Kibicho said, pointing to threats, such as the terror group Al-Shabaab. Uganda has a relatively liberal policy towards its 387,000 refugees and asylum-seekers, most of whom have fled conflict in the Democratic Republic of Congo (DRC) and South Sudan. Uganda does not have refugee camps as such, but most live in designated refugee settlements where there are allocated plots of land to farm. They can, however, get permission to live outside these settlements if they think they can support themselves, and Kampala in particular has a sizeable refugee population. Recent displacement from Syria, Afghanistan, Iraq, South Sudan, and Somalia has increased the number of refugees in the world to 15.4 million. Significantly, some 10.2 million of these people are in protracted refugee situations. In other words, they have been in limbo for at least 5 years, with an average length of stay in exile of nearly 20 years. Rather than transitioning from emergency relief to long-term reintegration, displaced populations too often get trapped within the system. ‘Self-reliance’ policy allows refugees freedom of movement, as well as the right to work or run a business. The economic lives of refugees in Uganda, how they interact with the private sector and how they use technology challenged five myths about refugees. Here is page with short outline and link to video discussing misunderstandings of Refugee Economics. 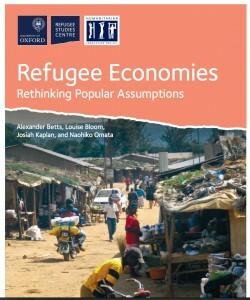 The full Refugee Economics study is online here (pdf). Carbon dioxide and particulates are both released from coal-fired power plants and not from solar, wind, and hydropower. Power plants fired by natural gas power don’t emit particulates and release far less carbon dioxide than burning coal (though studies show some methane is released by leaks in natural gas drilling and transportation). …in 2013 the city’s administration swore to stop using coal in the large power-plants that supply electricity to the capital and its 21 million inhabitants. By 2015, three of its four coal-fired power plants had been shut down and have switched to natural gas. On Saturday (Mar. 18), the Huaneng Beijing Thermal Power Plant, which produced 845 MW of power—more than a tenth of the power created by all power plants near Beijing—was closed down, too. Its transition to burning natural gas will start soon. But the city’s hunger for power means it’s unlikely to run on coal-free energy any time soon, or that regular blue-skies will become a reality. Beijing still gets a chunk of its power from neighboring provinces such as Hebei and Inner Mongolia, where huge coal-power plants are in operation. Coal is the dirtiest of fossil fuels. Per kilogram, it produces the least amount of energy and the most amount of pollution (as carbon dioxide, particulate matter, nitrogen oxides, and sulfur oxides). And China consumes a lot of it. The Earth’s atmosphere is 78 percent nitrogen, 21 percent oxygen and 1 percent other gases, including about 0.04 percent carbon dioxide. Carbon dioxide in the atmosphere has risen from .00028 (.028) at the beginning of the industrial revolution due mostly to burning of fossil fuels in developing and developed countries. 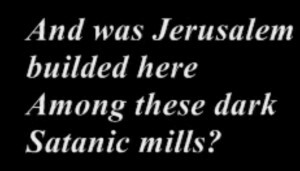 Particulate pollution from coal burning in China today causes health problems similar to pollution from the “dark satanic mills” during England’s Industrial Revolution, that William Blake wrote of. The Big Smoke developed in London on Dec. 5, 1952, triggered by a period of cold weather collecting airborne pollutants, mainly from the coal fires that were used to heat homes at the time, which formed a thick layer of smog over the city. According to the United Kingdom’s public weather service, it was so thick you couldn’t see from one side of the street to the other. In one East London area, it was reported to be so thick people could not see their feet. See also “60 years since the great smog of London – in pictures,” (The Guardian, December 5, 2012). 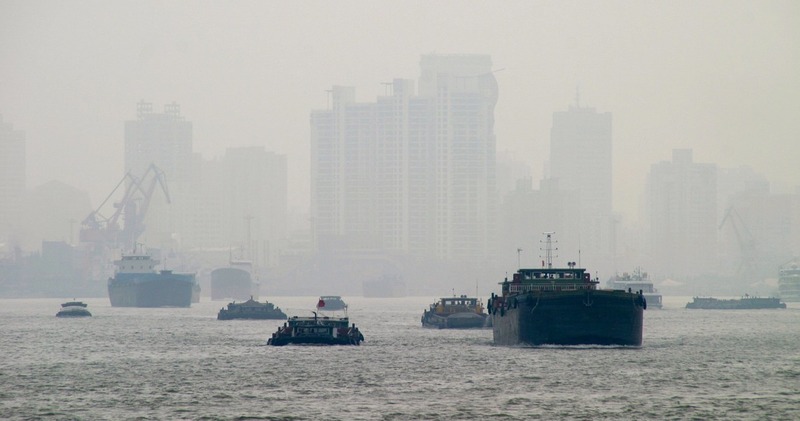 A team of atmospheric scientists researching pollution in China say they’ve cracked a 60-year-old mystery — with research that explains not only the haze over Beijing, but also the remarkably toxic Great Smog of London from 1952. By examining conditions in China and experimenting in a lab, the scientists suggest that a combination of weather patterns and chemistry could have caused London’s fog to turn into a haze of concentrated sulfuric acid. And earlier post, “For Still-Poor China, Coal Pollution from Home Heating,” focuses on China coal burning for heat, and the heavy pollution consequences. 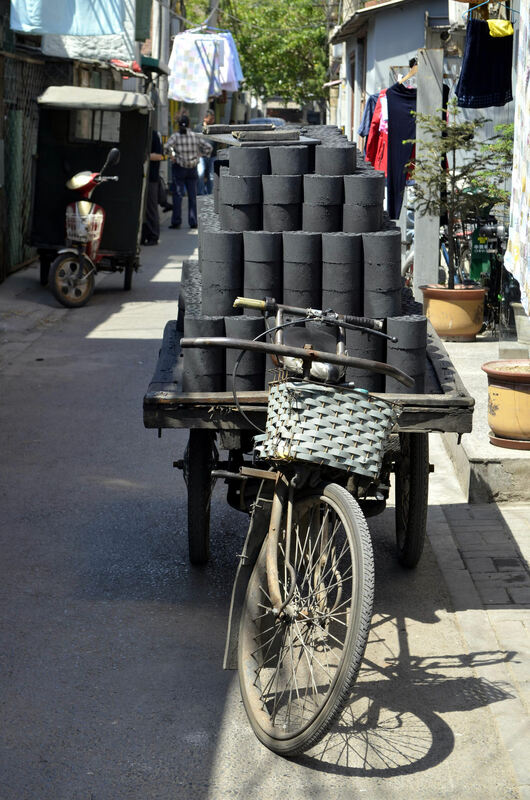 This earlier post highlights a key article: “Beijing’s Plan for Cleaner Heat Leaves Villagers Cold,” (WSJ, Jan. 25, 2017) which reports the continued problem of burning coal for home heating in communities near Beijing. 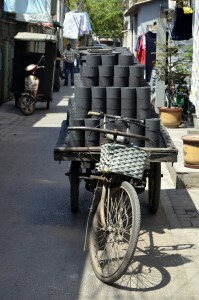 Chinese government policies that try to reduce CO2 emissions from burning coal rather than reducing particulate emissions, raise electricity costs, which results in more Chinese people burning coal at home instead of drawing electricity from the grid.